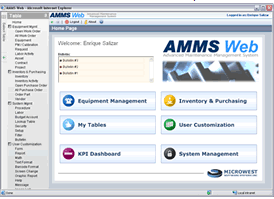 AMMS fully integrates all aspects of Maintenance - Equipment, Preventive Maintenance, Work Orders, Labor and Outside Contractors, with Spare Parts Inventories, Purchase Orders, Vendors, and Budget Accounts. AMMS is fully scalable, all the way from single or few-user systems up to large Enterprise-wide SQL Server and Oracle based systems. AMMS can grow with you: start with one or several small systems, and scale up to one large, integrated multi-site system as your needs grow. Comments: This software is very user friendly, very useful and easy to link spare parts to equipment in work orders.